This tutorial shows you to get current GPS location programmatically in android. In android, location based services are provided by the LoacationManager class which is available in android.location package. 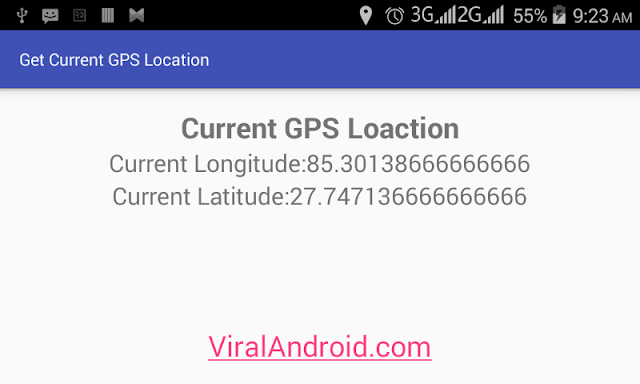 Following is the simple example which shows how to get and display current GPS location programmatically in android application. To get location in android you have to add location and internet permission in project manifest file. To get current location in android, you have to add internet and location permission in AndroidManifest.xml file which will look like this. Following is the modified content of XML layout file. Following is the modified content of java activity file. That’s all. Before running your Get Current GPS Location Programmatically in Android application you have to enable GPS from your android device or emulator. Your Application will look like output given below.